For years, even while he was working his way toward the 2017 250SX West Region Championship, Justin Hill said he was just counting down toward his full-time birth into the 450 class. Sure, just about all the 250 riders will claim the 450 “suits their style” when they move up, but Hill has been even more adamant than others, and he had a few flashes of brilliance last year on a 450 to back those claims. So now his full-time 450 career is about to begin, for real. 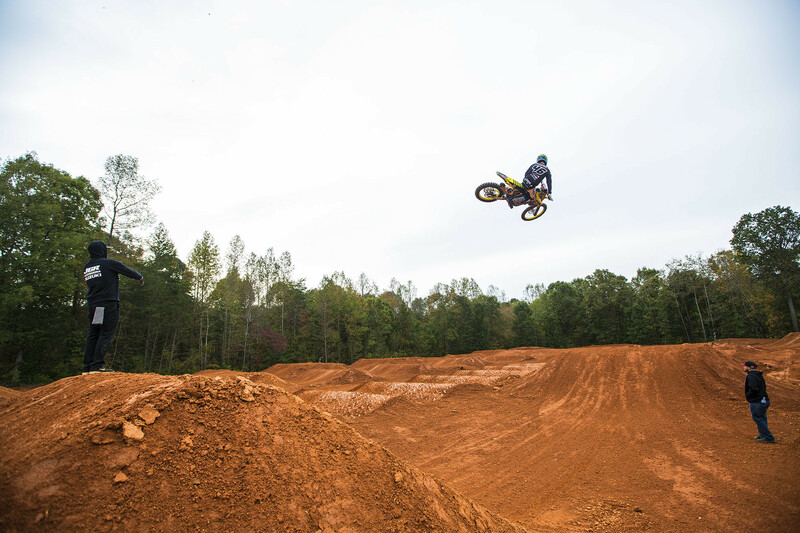 We checked in with the JGR/Yoshimura Suzuki rider a week ago after he logged a day of 20-minute motos in North Carolina. Racer X: You put in some motos today. You are putting in some work. You’re grinding. You do have a grinding gear in you? Justin Hill: Oh, absolutely. I have like the old school, blacksmith, fireplace heating up the metal, forming it with a hammer. I do have that in me. I have a lot of my old man in me. You’re not just a guy that looks for cool things to jump? Well, I mean, I do that too. I like finding big jumps. Right now I’m so motivated and I’m so in the mood to work as hard as I can at this, because now I believe is when my career starts. I believe this is my time to shine. I’m having so much fun, but I’m trying to take a lot of advantage of it. I’m trying to work harder. Honestly right now I feel like I’m the most cut I’ve ever been. I’m in the best shape I’ve ever been. I feel good, I feel really good. I’m out here in North Carolina for now obviously, but we’ll be back on the West Coast, I would say mid-December, to kind of finish off what we’re doing there, just to get on some of that hard pack. It’s hard to travel back and forth once the races start. So, we’ll be on the West coming soon. I’ve been grinding hard out here and it’s going well. As long as I can replicate what I’m doing out here and make sure I get the program mirrored out there, I think we’re looking really good. You’ve always said you wanted to race a 450. That’s always been the goal. So this is your first “I am now a full-time 450 guy.” Is that why you’re feeling this vibe? This is the moment you’ve been waiting for your whole life? Yes, I wake up in the morning and I’m stoked to ride, ever since I’ve been riding a 450. I’ve said it so many times, but little bikes never fit me. Since I swung my leg over a big bike, I knew that’s what I wanted to ride. 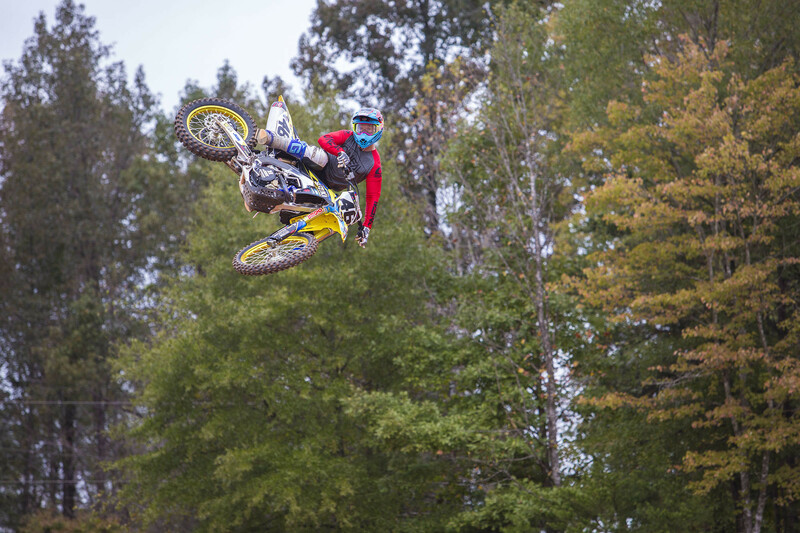 When I was 14, I swung my leg over a 450 and it was like, I looked pretty comfortable right away. I would always do better at amateur nationals on them. The only races that meant a lot were the ones that I won on little bikes, but it was just because they were little bike races. Loretta’s everybody goes on the little bikes. Monster [Energy] Cup you go as a Lites rider. But I’ve always been a big bike guy. I think I have way more 450 championships than 250 championships as an amateur. I don’t know that for a fact, but from my amateur days I know I’m more comfortable on that bike. I say it time and time again, I think it’s just more that the bike can operate much better at the RPM’s I want to ride. I’ve never heard anyone do supercross laps hard at the RPM you’re doing today. You’re not cruising, even though it sounds like it from that low-RPM. That’s you pushing it. Yes, I’m pushing, but I work to be in the meat in the torque the whole time. With that, I find more traction and I can cut lower and I can do different things I think people miss out on by overworking the bike. So I think I have a couple advantages with that. I think it has already somewhat proven itself just how I have the speed against these guys so far. Every time I’ve been near them and had the chance to wonder, "Am I fast or not?" I’ve had the speed. I’m just trying to fine-tune, I’m just trying to shine up the stone and make every other piece of my program good. Starts are huge for me right now. I’m doing a lot of starts. I just need to be up front when we go. People might be listening to this and say, “Oh, but in Paris the starts were terrible,” but you did explain that. You didn’t have a factory engine there… or was that the race that made you actually what to practice starts more? Both. I had a stock engine, so I had a power disadvantage, which didn’t help. My starts weren’t good either. I think that was my eye-opener when I got back. I already had it in the back of my mind, but going there and getting a last-place start every race, I was like, "I don’t want to do this for 17 rounds, I need to work on this." So when we got back, I’ve been doing more of them. I’m pretty smoked after the motos today, so we didn’t do any today, but I’ve been doing a lot of them already this week. My brother is a huge help with starts. Bud Man [Buddy Antunez] is a huge help with starts. They know what to look for. I think that’s the hardest thing for a rider, to say, "What am I doing wrong on the start?" Because you can’t really feel it because it’s just like an explosive thing. When I’m riding around the track and something isn’t right, you can normally feel it. You can tell that feels slower or this feels sketchier. But starts are just like, "Why am I wheeling?" There’s less to go off of, I feel like. Less of a feel to go from. So, I think with their help right now we’ve made big improvements so far. I think I will be better at starts on the big bike than the little bike. I’m not at as big a power disadvantage. We have a very, very good engine to race with. I don’t think my weight plays a part like it used to. Obviously with the little bike I always said outweighing everybody doesn’t help. So, I think we’re right on the path we need to be to make sure I’m getting the starts dialed. It’s just taking some time to do it and put the work in. What about the training here with Seth Rarick? He’s an animal. He’s an off-the-bike animal. How’s that work for you? Oh yeah, I don’t think I’ve ever had so much structure in such a short amount of time. We’ve really been getting after it. It’s tricky because I think ordinarily my ideology behind training is we put the work in on the bike, and then we get done from the track and if you have energy, go train. To me training is just icing on the cake. I still have that idea. I think it’s more important to put more time on the motorcycle, and Seth does agree with me with that. But it just seems like we just train anyway. Whether you’re tired or not? I think I’m grinding that way harder than I ever have, too. Honestly, we’ve been just crushing core workouts, just day in, day out. I just feel ultimately stronger, but not in a bulky way. I’ve lost a lot of weight, I’ve trimmed down. Everything feels like it’s working just like an oiled machine. I feel good about it. So, the challenge now is to keep that on the tracks until not just even January, but all the way through the end of the season? All the way until May and then we regroup and do outdoors. The whole big scheme of things is to just keep this steady grind with no hiccups. Luckily, I’ve been pretty healthy. I made a couple changes with my diet and stuff: a couple of things I was allergic to I stopped eating—that kind of stuff. Is there stuff you didn’t know? I’ve never missed a race from being sick, but when I was at Indy, I was in the hotel room and I was just so sick. I didn’t sleep. My alarm went off to go to the track and I hadn’t slept—I was just throwing up the whole time. Didn’t sleep. I was so trashed that I missed that race. I was like, "I need to do everything I can to never let this happen again." So, I think my immune system is better than it used to be, which is going to be huge. So, did you do some tests or something to figure stuff out? Yes, we did. We did like allergy stuff and basically just re-collected some stuff that we had before and went off of that. I feel way better. Eggs were a big thing. I would eat eggs every single day and I was badly allergic to them, apparently. Yes, my whole life I’ve eaten eggs every day. So, now I have an egg every once in a while, and obviously lot of things have egg in them, so it’s hard to avoid entirely, but the people were just like, try to do your best to not eat eggs, as little as possible. I feel like my immune system’s better. So, Indy was not the first time? Oh, no, I get sick all the time. This is the longest I’ve been not sick in years. So, you are a rookie going into the 450 class. We know you like riding 450’s. You’re good at riding 450’s. But still, are there certain things that you’re like, I’m not sure how it’s going to go? I haven’t raced these dudes. I haven’t raced that many laps. I haven’t raced that many rounds. Does that stuff cross your mind at all? I feel like you’re more seasoned than some other rookies, but you are still a rookie. Is this all one corner in Tampa? No, not just that. That was an error on my part. It was my first ever race [in 450SX]. I was passing for the lead and I just got excited. That was really it. I don’t think we’re going to see that repeated over and over again. I think I was just excited. I was like, I can win this main! Just jazzed. So that was really it. As for the 20 minutes of racing, I think that’s going to play in to my favor, ultimately. I think I’m a pretty efficient guy. I think if I’m tired, I can ride it out. I generally don’t really get that tired. I’ve had a couple of races where I had got arm pump pretty bad just from whatever it was—a bike setup, this or that, just little things. I think ultimately, I very rarely get tired. You told me before that even when the tracks are gnarly, it’s not just about who’s in shape, but if you don’t do all the rhythms right and you don’t tense up and you’re relaxed on a tough track, that does way more for your endurance at the end of the race than your actual fitness. Yes, just staying solid, hitting every single rhythm every single time. I think I’m pretty good at that. When I won my championship and I was at my top on the little bike, that’s how it was. I was just relaxed, and I would just jump every rhythm, every lap. I would just click laps off and click laps off, and then just stay solid. I think I have an even better shot at doing that on a big bike, because it fits me. I don’t have to ring the thing out to go fast.